First there was the predictable elite bashing and then a few disagreeing and explaining ACSI had not only done nothing wrong but was even smart to choose the MRT over buses. This morning this topic was discussed on FM 93.8. 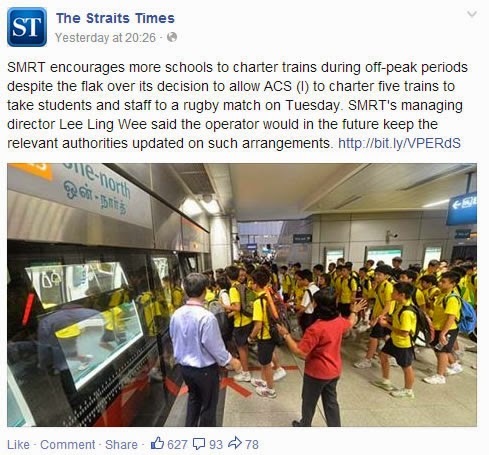 All except one were in agreement with ACSI and SMRT. I thought this was the occasional voice of the SILENT MAJORITY in Singapore. The silent majority isn't always silent. To me I think they only are because they are mostly busy people with the usual life's priorities to attend to. So busy till they are silent. Count me among them. I don't even care to try to write clearly for those who drop by this blog because there is no time. However you can draw out their voice like the elite bashers just had. I am not sure if the government think about such matters because it is imperative for them to hear through to the silence of the silent majority. For starters they could try to understand what causes the silence to become vocal. In this instance it was the irrational and petty elite bashing. We aren't naive enough to believe a society without its elites. A healthy society must have its elites. The healthiest societies have an informal elite class. Let's keep our elites and encourage them to be informal. You know they are informal when they are usually invisible except the moments when they have to lead. If we get it right our elites would be less ostentatious. Some of our old wealth families had it and when the newly rich arrived we lost it. There are many ways to begin. One possibility is for fewer luxury marques irritating us with their noise as they speed along our roads ignoring speed limits and red traffic lights. So if you have it, don't flaunt it. The time has past when people admire or envy you. The time has come when people begin to disdain and even hate you. What for? And if you think you can relocate to another city, that new home is likely to offer you a worse reception than here. This is a global phenomenon.